Viabrand is one of Brisbane's most popular branding and marketing agencies, offering a comprehensive suite of branding and marketing services to businesses of all sizes. Viabrand's approach to branding and marketing is deeply rooted in strategy, producing industry leading campaigns and identities that cut through the noise. To discuss your branding or marketing goals, get in touch with Viabrand today via their website. Description: Brands that Move. 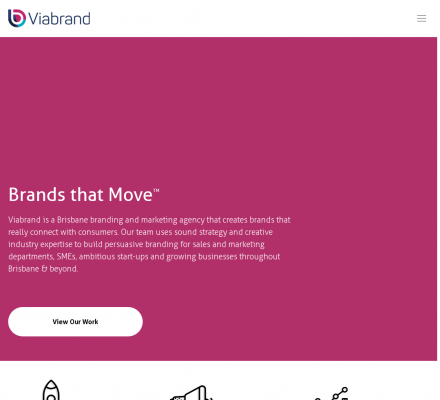 Viabrand is a Brisbane branding and marketing agency that creates brands that really connect with consumers. Millward Brown (Popularity: ): Helping clients build profitable brands and services through research based consultancy. Brand DNA (Popularity: ): Helping firms improve their image and marketing strategy. Offices in New York and Paris. BrandForward, Inc (Popularity: ): Overview of the brand management process with trivia, management checklists for upcoming conferences, books and speakers. Integrated Marketing Group (Popularity: ): Communication services for brands in the natural products and high-tech industries. Jump Associates (Popularity: ): Creates product strategies that show how families of offerings can be systematically developed over time. Wernick Marketing Group (Popularity: ): Marketing communications company specializing in public and media relations, consulting and event planning. GT&A Strategic Marketing (Popularity: ): Provides naming and branding services for emerging technology firms. Mountainview (Popularity: ): A London-based consultancy in strategic branding and global brand positioning. Red Spider (Popularity: ): A media neutral consultancy which provides pan-global brand strategy and account planning training. Deskey (Popularity: ): Integrated design and branding services with offices in New York and Cincinnati. Brandtutorial.com (Popularity: ): How to create brand awareness, value and loyalty.